Cisplatin is a chemotherapy drug which is used to treat cancers including: sarcoma, small cell lung cancer, germ cell tumors, lymphoma, and ovarian cancer. While it is often considered an alkylating agent, it contains no alkyls groups and does not instigate alkylating reactions, so it is properly designated as an alkylating-like drug. 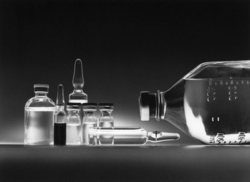 Cisplatin is platinum-based and was the first medicine developed in that drug class. Other drugs in this class include carboplatin, a drug with fewer and less severe side effects introduced in the 1980s, and oxaliplatin, a drug which is part of the FOLFOX treatment for colorectal cancer. The other names for cisplatin are DDP, cisplatinum, and cis-diamminedichloridoplatinum(II) (CDDP). Cisplatin was first created in the mid-19th Century and is also known as Peyrone's chloride. (The discoverer was Michel Peyrone.) It wasn't until the 1960s that scientists started getting interested in its biological effects, and cisplatin went into clinical trials for cancer therapy in 1971. By the late 1970s it was widely used and is still used today despite the many newer chemotherapy drugs developed over the past decades. Cancer Research UK has a great article about how cisplatin came to be recognized as a cancer drug. Cisplatin is off-patent. That means no company has the exclusive right to its manufacture and any credible drug company can make it (subject to government-approved safety regulations.) Bristol-Myers Squibb sells Cisplatin under the brand name Platinol®. The Chemical Abstract Registry (CAS) number is 15663-27-1.). The chemical formula is Pt(NH3)2Cl2. Molecular weight is 300.045. Cisplatin is soluble in water and delivered to the body in aqueous form. Cisplatin is called the “penicillin of cancer” because it is used so widely and it was the first big chemotherapy drug. Cisplatin also plays an interesting role in the history of chemistry. First synthesized in the 1800s, long before anyone thought of using it against cancer, cisplatin was a target compound chemists used to prove their moxie in inorganic synthesis. The shape and symbols of the molecule as represented in that discipline's iconography is aesthetically pleasing which is another reason people like to talk about cisplatin. Cisplatin is a simple molecule – only 11 atoms. Medicinal chemists are known to exclaim – mon dieu! What a small molecule! It's certainly different from the big biologics being introduced to the oncologist's toolbox in recent years. New chemotherapy drugs have arrived on the scene over the past few decades, but cisplatin still finds wide use. Even when it is not the only or main drug given the the cancer patient, it can be a valuable part of a combination chemotherapy regimen. Look at the regimens given to patients and you will often see cisplatin as one of the drugs. Even with the advent of the so-called targeted therapies in the past ten years, cisplatin use remains strong. It's tough on health body tissue, as are mmany oncology drugs, but that doesn't mean it isn't useful in the treatment of disease under the direction of a physician. The side effects can be serious – they vary from patient to patient of course – but hundreds of thousands of people have been given cisplatin and the medical establishment has learned how to deal with it. The way that cisplatin operates is by forming a platinum complex inside of a cell which binds to DNA. When DNA is cross-linked in this manner, the cell undergoes apoptosis, or systemic cell death. Damage to the DNA activates the cell's repair mechanisms. Once the repair mechanisms are activated and the cells are found to not be salvageable, the death of those cells is triggered instead. Cisplatin is frequently given as part of a combination chemotherapy regimen with other drugs. And even though it is an "old" drug as chemotherapy agents go (having been used for decades), it continues to find uses, especially as it is synergistic with other agents.